Natuzzi Editions produce some of the finest designer style sofas in the world. The Placido B986 combines contemporary cool urban minimalist living with retro influences that echo back several decades. With a low seat this is a very young at heart design and gives a surprisingly high level of comfort for such a cool looking sofa. With seems running vertically and horizontally across the seat back and seat pad, The Natuzzi B986 Placido is visually pleasing as well as practical in the way that the seams will reduce puddling and the sofa will keep its form well. The cool contemporary box arm design is well padded at the top and very comfortable to lean on. Available as you 3/4 seater sofa, huge cuddle over loveseat one come create the perfect combination for living space. The Natuzzi Placido B986 is also available as a fabulous corner group which really suits this particular style and design. Selecting from a whole world of lethers from rustic natural un-protected for the aniline leather, giving an urban industrial or country living ambience, to Madison nubuck style leathers that can be selected in conventional colours or modern designer blue or burnt orange suede style which really suits this particular sofa or corner group. The care and attention to detail from the craftsman and artisan upholsterers at Natuzzi’s Italian factory is clearly apparent on this very beautiful designer object of art. 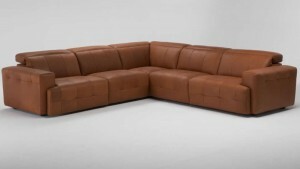 Nominated for the style international awards this sofa or corner group would be a definite deserved winner. This sofa has been showcased as part of the collection at the U.K.’s largest Natuzzi Editions Gallery at Furnimax Accrington Lancashire UK.